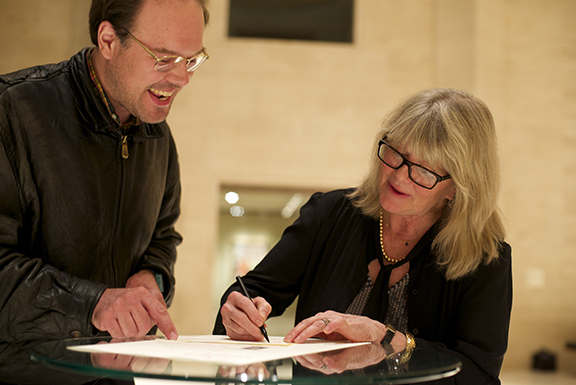 2014 Geske Lecturer Judith Ivey signs an autograph at Sheldon. Photo by Michael Reinmiller. The "Norman and Jane Geske Lectureship in the History of the Arts" was established at the University of Nebraska-Lincoln Hixson-Lied College of Fine and Performing Arts in 1994 and continued through 2014. The series has now ended. The Geskes created this series, which funded visits by prominent authorities on the history of the visual arts, music, theatre, dance, film and architecture. The series lectures were meant to advance the field with creative writing and thinking on subjects that reflect the importance of historical perspective in all the arts. The Norman and Jane Geske Art History Lecture Series provided not only the campus community, but also the general public, with new insights into the history of the arts. This series paid a fitting tribute to the Geskes longtime service to the arts. Norman Geske, a native of Sioux City, Iowa, received degrees from the University of Minnesota in Minneapolis and New York University's Institute of Fine Arts. He came to Nebraska in 1950 as assistant director of the university art galleries and became director in 1956. Involved in the creation of the Sheldon Memorial Art Gallery, Geske served as its director until his retirement in 1983. He was instrumental in creating the Interstate 80 Bicentennial sculpture project, the Museum of Nebraska Art in Kearney and the Mary Riepma Ross Film Theater. Geske received an honorary doctorate from Doane College in 1969, the Governor's Arts Award in 1979, the Distinguished Service Award from the University of Kearney in 1980, the Mayor's Art Award in 1987, and the Lincoln Foundation's Sower Award in 1991. Jane Geske, a native of Sutton, Neb. and an alumna of the University of Nebraska at Omaha, was a former director of the Nebraska Library Commission and served as president of the Nebraska Library Association and the Nebraska Committee for Cultural Resources, the predecessor of the Nebraska Arts Council. She was also a founding member of the Nebraska Literary Heritage Association, the Friends of the University of Nebraska-Lincoln Libraries and the Nebraska Center for the Book, which has named its annual award for service to literature in her honor. Mrs. Geske won the Mayor's Art Award in 1994. The Geskes owned and operated the Estuary Bookstore in Lincoln, which specialized in literature and the arts. "Speaking or Singing? Translating Early Music"
"Painting in Venice: A Personal Point of View"
"The Floor of the Sky: Prairie Landscapes in North America"
"Booth, Lincoln and Theatrical Reception"
"Why Art History: An Exploration of Tem and Ptah"
Selected lecture publications from previous Geske Lectures are still available. Contact us at unlarts@unl.edu to inquire.